Interested in joining the City of Hickman's team? All job postings with the City will be posted here. City of Hickman - Public Works Department Maintenance I Please check back regularly as job postings will be posted here when available. Also make sure and 'LIKE' the City's Facebook page at http://www.facebook.com/CityofHickman for regular updates on employment opportunities. . . . The Hickman Area Reading, Technology, and Historical Centre is open to all residents who would like to check out books, DVD's, or have access to an internet capable computer. Books and DVD's may be checked out for a period of three weeks and although the Centre does not collect overdue fines, the Centre appreciates the return of materials in a timely fashion so that they are available to all of the . . .
Click on the following PAYPORT image to pay your utility bill. All major credit cards are accepted. You will need to know your Balance Due, Customer Number and Service Address to process payment online through the portal. (Online Bill View is coming soon.) 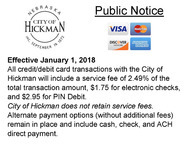 Effective January 1, 2018 All credit/debit card transactions with the City of Hickman will include a service fee of 2.49% of the total . . . Welcome to Hickman - A Great Place to Live If in your life journey, you were looking for a great place to live, you have found it in Hickman! Where else could you find a growing and thriving community with strong Nebraska family values that is located just minutes away from the Capital City? Where else could you find a better quality of education than that provided by the Norris School District? Where else could you find yourself . . . Prior to 1866 the place where our town is now located was open prairie in what was then Clay County. The few families who lived here had a difficult time of it since the closest market for selling things and purchasing supplies and lumber was Nebraska City. One of the early settlers, Rev. C. H. Heckman, lived near Salt Creek. As time went on, he purchased the adjoining 80 acres. This later became our town. A post office, established in . . .